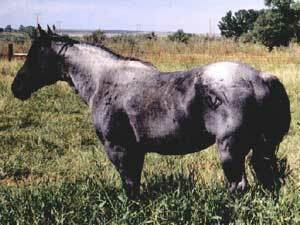 Hancocks Blue Boy was a blue roan stallion that was bred, born and raised at the Broken Bones Cattle Company. Blue Boy had a great disposition and confirmation. He was 15.1 hands tall, weighed 1,400 pounds and wore a size two shoe. His dam was Bluebird Hancock, a bay roan mare sired by Apache Joe Hancock. Blue Boy's sire was Mr Roan Hancock a blue roan stallion leased by John & Marie Whipp from Gary Tarver in 1985. Blue Boy was broke to ride and was bred at the age of three. In 1990 he had 13 foals, 9 blue roans and 4 bay/red roans. He was bred privately to mares owned by John & Maire Whipp for nine years. He produced exceptional horses until he passed away in the fall of 1998. Blue Boy was known for passing his temperament, conformation, and color on to his foals. He had nine colt crops and 188 foals. He threw 72% blue roans and 25% bay/red roans. Many of his sons and daughters have been used for roping, cattle work, breeding programs or more than one profession. 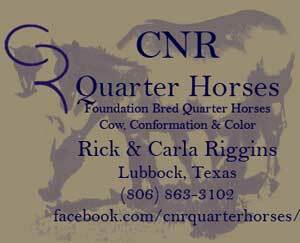 Blue Boy has three sons that have exceeded in the AQHA World Show arena. A 1994 blue roan stallion, called Timber Hawk Hancock, qualified in the Open Junior Heading and Tie-Down Roping World Show in 1998. He, also, qualified in the Open Junior Tie-Down Roping World Show in 1999. Broken Bones currently has a son of Blue Boy called Pede Hancock Boy whom they campaigned in 2003 & 2004. Pede was trained and ridden by Doug Clark of Wayne, Oklahoma. Pede qualified in the Open Junior Tie-Down Roping World Show in 2003, where he placed 5th. That same year he placed 9th high point earner in the Tie-Down Roping. In 2004 Pede qualified for the AQHA World Show in Senior Tie-Down Roping, Senior Heading and Senior Heeling. The third son is a blue roan stallion called Blue Boys Drifter out of a Driftwood mare. Blue Boys Drifter qualified for the World Show in 2004 & 2005. In 2004 he was 4th high Junior Heeling and 9th high point earner in Open Heeling. Blue Boy's sons and daughter have excelled on every level of competition whether it be a World Show or just a local jackpot. They can be found throughout the United States, Canada and Mexico.